As much as I love wedding cakes with sugar flowers, I also love wedding cakes that feature real flowers and plants. Just like this cake with succulents. 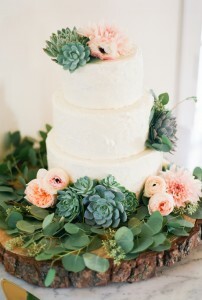 I love the understated elegance of the cake and the use of succulents just adds to that elegance. I have to admit as much as I love bright flowers on cake I also love when brides forgo that bright pop of color for something a bit more understated. 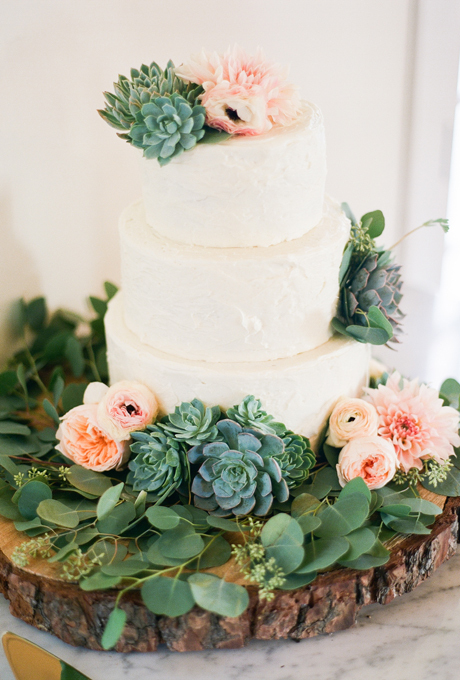 The simple three tier cake features succulents, anemones, and ranunculus and it’s presented on a simple wood slab from a tree. This cake would be gorgeous at a spring or summer wedding – especially with an outdoor reception. This gorgeous cake was created by The Butter End Cakery and was featured here.